We started with a simple question: What surprises have you experienced since you started deploying flash storage in your organization? 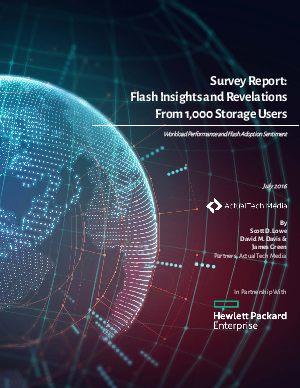 Of course, surprises can be good or they can be bad, but we sought to understand what may have changed – and what’s not changed – since our survey respondents deployed flash storage into their environments. To that end, we asked 1,000 people to share with us their attitudes and experiences around storage. In this report, we will share with you what we learned and how you may be able to use this information to better inform your own path forward. Sponsor: HPE and Intel® processor. Intel and the Intel logo are trademarks or registered trademarks of Intel Corporation in the U.S. and/or other countries.